Charlton Athletic WFC boss Jeremy Parsons says his side can maintain their "winning momentum" next season. 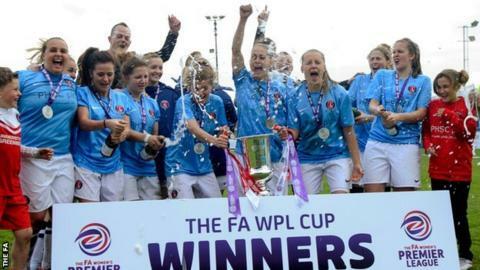 The Women's Premier League Southern Division side missed out on their dream of promotion to Super League Two as Portsmouth won the title on Sunday. But third-placed Charlton won the Ryman Cup, the Premier League Cup and the London FA Capital Cup to seal a treble. "We've had a fantastic season," Parsons told BBC Sport. "I couldn't have asked for more. It's been a good success." Charlton also reached the quarter-finals of this season's FA Women's Cup, losing to 2014 finalists Everton on penalties. With one league match remaining this season, Parsons' side have the best goal difference in the third tier's Southern Division. "Hopefully we're going to push for the league next season," he added. "Our aim is to get to WSL 2. "We had a lot of mid-week games and a lot of travelling. The girls have been juggling work too, so it isn't easy, keeping a rhythm going. "The challenge was to compete. We more than did that. We need a rest now and then it's about having the belief from the start."